The aqua feed market is foreseen to exhibit lucrative growth opportunities for vendors in the coming years, as reported by Transparency Market Research. The vendor landscape of this market is reported to be a highly fragmented one. Global vendors are seen competing with local and regional players, especially in developing regions. Vendors in the global aqua feed market are seen focusing on mergers and acquisitions, in order to strengthen their market presence. Players are involved in the expansion of their production capacity with an aim to capture large market shares. A key trend that is seen being capitalized on by companies is experimentation with sustainable feed techniques. This ensure that the nutrition needs of aquatic creatures are satiated, while becoming a USP of the vendor. Ensuring product differentiation in this way is expected to help vendors gain traction in the global aqua feed market. Key vendors operating in the aqua feed market are Norel Animal Nutrition, BASF, Novus International, Ridley Corporation, and Cargill. As reported by TMR, the global aqua feed market is prognosticated to witness a 11.4% CAGR over the forecast period of 2013 to 2019. The market was estimated to be at US$57.7 bn in 2012 and is predicted to rise to US$122.6 bn by 2019. 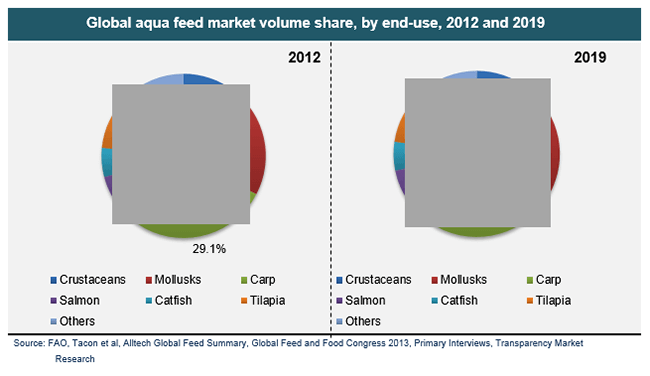 Among the different end-use segments, carps held a prominent share of the global aqua feed market in 2012. This could be attributed the compatibility of carps in the face of harsh environmental conditions. Geographically, Asia Pacific was reported to account for more than 65% of total market share in 2012. The region is expected to remain at the fore in the coming years on account of the flourishing aquaculture industry in the region, leading to high demand of aqua feed. The demand for fish and mollusks is ascending because of the expansion in pay levels and demand for protein rich solid nourishment products universally. As indicated by FAO fish represented over 15% of worldwide populace of creature protein admission. Expanding creation alongside extension of fisheries in creating economies will drive the general development in fish generation, in this manner bringing about expanded product demand. Expanding aquaculture activities is one of the essential components anticipated that would drive the aqua feed demand over the forecast period. Likewise, developing human utilization of fish attributable to rising consumer mindfulness about its medical advantages is expected to fuel demand for aqua feed in the coming years. With the developing worldwide populace and a comparing ascend in a sustenance deficiency, the industry is confronting a number of problems in getting crude feed, for example, angle feast and fish oil, which are exceptionally significant for production aqua feed and the development of the aquaculture business. The increasing expenses of extraction from these sources, combined with stringent controls over waste biomaterials and wastewater treatment, affect the worldwide market. Costs are expected to take off inferable from expanding demand, and unfavorably influence the aqua feed market. However, escalating demand for high-nutrition food products, rising disposable incomes, improved standards of living, and enhanced techniques for marine production is expected to help overcome the market restraints to a large extent.